Many of the physiological benefits of tulsi can be attributed to its ability to assist with the body's internal housekeeping and protection of the body from toxin-induced damage. These functions are often attributed to tulsi's high content of phenolic compounds and anti-oxidant properties, with Krishna tulsi (black/purple variety) having a higher phenolic content and anti-oxidant capacity than white Vana (wild) tulsi. 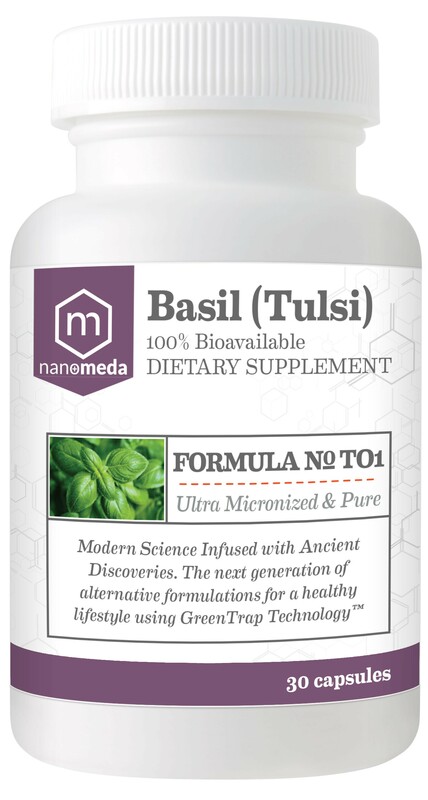 Laboratory studies have shown that tulsi protects against toxic chemical-induced injury by increasing the body's levels of anti-oxidant molecules such as glutathione and enhancing the activity of anti-oxidant enzymes such as superoxide dismutase and catalase, which protect cellular organelles and membranes by mopping up damaging free radicals caused by lack of oxygen and other toxic agents. Tulsi also helps to prevent cancers caused by toxic compounds by reducing DNA damage and inducing apoptosis in precancerous and cancerous cells, thereby reducing the growth of experimental tumors and enhancing survival. Furthermore, tulsi not only protects against the damage caused by toxic compounds, but also enables the body to more effectively transform and eliminate them by enhancing the activity of liver detoxification enzymes such as the cytochrome P450 enzymes, which deactivates toxic chemicals and enables them to be safely excreted. Our formulation is 100% bioavailable to obtain an optimal dose for safety and efficacy.